CPCC to provide specialized CNC machine tool training for Okuma’s workforce. 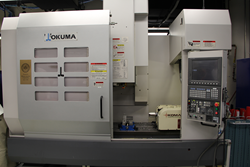 The MCV-4020 recently donated by Okuma to CPCC will be used to train CPCC students and Okuma members. This unique training program provides Okuma's workforce with the skills necessary to be successful in their careers. Okuma America Corporation is partnering with Central Piedmont Community College (CPCC) to provide customized machine tool training for Okuma employees. The program is funded through North Carolina’s NCWorks Customized Training Program and is implemented through the North Carolina Community College System. Okuma recently expanded its mechanical repair and exchange service departments in Charlotte and is receiving $63,310 in CNC training from CPCC to train new hires and current employees. The training programs include leadership, process improvement, SolidWorks, computer operations, electrical assembly and wiring, and enterprise resource planning. The training grant supports economic development efforts of the state of North Carolina by providing education, training and support services for eligible businesses, assisting them in their efforts to be productive and profitable within the state. Okuma and CPCC share a long standing relationship dating back to the early 1980s. For more information on Okuma machine tools visit http://www.okuma.com/cnc-machine-tool-lineup. Central Piedmont Community College is one of the largest community colleges in the Carolinas, offering nearly 300 degree, diploma and certification programs; customized corporate training; market-focused continuing education; and special interest classes. CPCC is academically, financially and geographically accessible to all citizens of Mecklenburg County. CPCC responds to the workforce and technology needs of local employers and job seekers through innovative educational and training strategies. Established in 1963, CPCC has provided more than 50 years of service to Mecklenburg County residents, business and industry. For more information, see http://www.cpcc.edu. Connect with the college on social media at http://www.cpcc.edu/social.